Yesterday didn't went a particularly good day in the first half and therefore was really quite pissed off with the proceedings. So, after office on my way home decided to chill out. So gave the right indicator to the traffic behind me, took a U-turn and reached straight to the "Bulland Motor", a TVS Showroom at Sona Adda Gurgaon. Off late I had seen a couple of Apache RTR Fis on the roads and yesterday just thought why not a test ride!! So let's go straight to the details. Before I start let me confess that for the test ride, I was not provided with the best of the strips where I could just whack the bike and test it's performance. Therefore in my review I would not comment of the performance figures, just the overall ride experience and what to look out for and what more could have been done on the bike. So, the strong points of the bike first!! The bike has been given a very aggressive look and stance. It's racing written all over it. The extended tank cowls and the racing strips that starts from the front and goes up to the tail adds tones of attitude to the bike and make the package look more sporty.The finishing of the bike is one of the best amongst TVS's current stable. The quality of the instrumentation is also pretty decent. The Digital Display also looks neat and refreshing with it's Blue back light and the overall assembly of the Console is quite impressive. Simply fell in love with it. It's just awesome. The grave note of the engine as soon as you start it... fills your mind. It's simply works like an identity card for the bike.... you can identify the engine note very distinctively. It's even better than the engine note of the Yamaha R15. 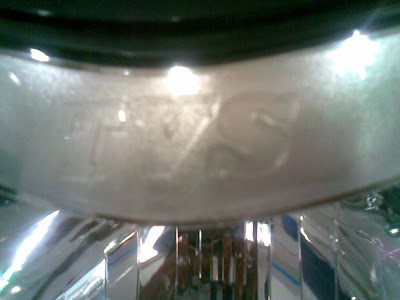 TVS bikes have been often associated with engine vibrations. But personally I found the RTR Fi pretty smooth and calm. Even though I didn't get a chance to take the bike past the 6K mark, but still the engine was smooth and the feedback from the engine was quite pleasant and that also for a Test bike which we know are the most abused in the lot. The handling of the bike inspires a lot of authority and confidence. The low seating of the bike would suite an average height ed person and would allow him to flick and tilt the bike like bliss. The handling is further complemented by the Rear Petal Disk, which is smooth and crisp. 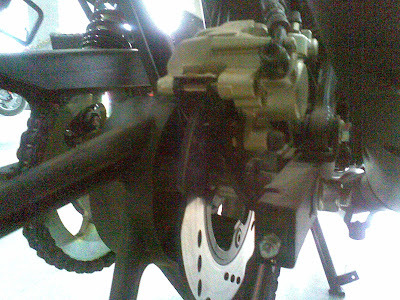 The disk brake provides the exact rear breaking power required. There were couple of time were I hit the rear disk both at high and low speeds and not a single time there was a loss of traction or wheel lock occurrence. This is a great sign. To make things more comfortable, the front shock absorbers and the rear gas filled suspension handled most of the pot holes comfortably and left my back smiling. The front fork and the rear suspension are neither too soft nor too hard, they are just perfect for city conditions. 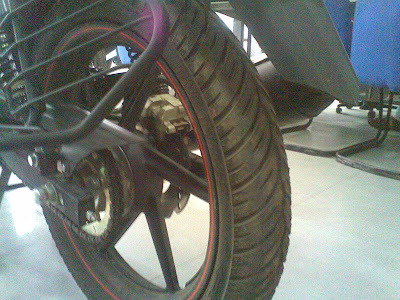 Personally I felt the character of the front Petal Disk has improved a lot since it's launch with Apache RTR 160. The brake is power full but not panicky. They work like butter. The stop time was also very precise as I think I went from a speed of 60-0 kmph in less than 3 secs with a penal at my back (the TVS guy). The Gear Box of the Apache RTR Fi is very much refined and smooth. I had no difficulty in shifting through the gear, neither when I was shifting slowly and in a relaxed manner, nor when I was shifting quickly and in a hustle. I never missed a single gear. 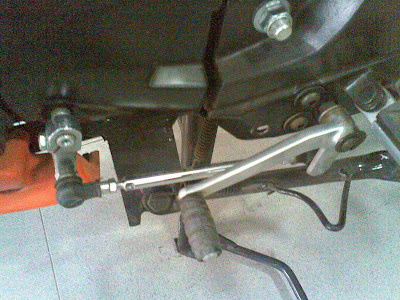 Again, the gear shift lever is assisted with another lever which transforms the up/down gear lever motion to a lateral to and fro motion which according to TVS is the main reason for such a smooth gear shift. Also, finding the neutral on the bike is also very easy and hassle free. Now let's take a look at the factors as why my experience with the Apache RTR Fi didn't excited me much. The sitting posture of the RTR Fi still remains a confused one. The foot-pegs are rear set but you need to reach out for the handle bars. For my height I found that a bit uncomfortable and awkward. I felt like as if I was riding a proper commuter bike with the foot-pegs pushed a couple of inches back and the clip-on handle bars have been shifted forward by the exact number of inches. Again the orientation of the Clip-On Handle bars were not very exciting. I personally felt that the neck of the handle bar was one inch too much and angle between the neck and the grip bar should have been 5-6 degree lesser. But again, it's my personal opinion and many might find the current configuration perfect. One thing which I very distinctively noticed about the RTR Fi was that the fun begins only after you engage the 3rd gear. Once in 3rd gear or higher, the bike is all eager to blast off and rip the tarmac apart, but in 1st and 2nd gears, it just refused to do so. It was very lame and docile and the power delivery was not even lacking..... it was absent. The TVS guy with me explained this by saying that the bike has less fuel and the Fuel Injection system was not able to work properly. But again that even does not explain this lack of power in the 1st and 2nd gears, because if low fuel was the cause, then the experience would have been the same across all power terrains but that was not the case. Therefore as per my observation, if anybody wants to have fun with the bike, he better stays in high gears. 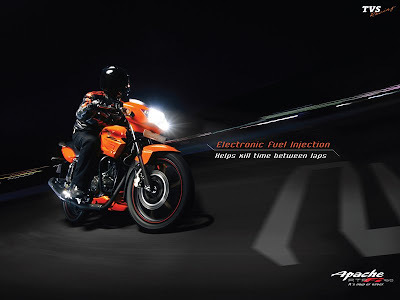 I didn't understand with all the aggressive style for the Apache RTR Fi (and even more aggressive marketing with the TVC reminding us of the first Pulsar DTS-I TVC), why did TVS go for such a feeble horn for the bike. It simply dosent match with the overall personality of the bike. I really felt that the rear tyres should have a tad bigger than it's current size of 100/80. At least a 100/90 section or a little more should have been perfect. It not only would have added to the overall stability of the bike, but also cosmetically would have looked great on the machine. With a price tag of 70+ plus I find the Yamaha FZ16 a better purchase than the RTR Fi. Overall I found the Apache RTR Fi not very exciting as marketed by TVS but a nice package to go for, if the rider can get the sitting posture comfortable as per his height. The bike is good for both highway as well as city riding. I think it's one of the best bikes TVS has come up so far and certainly the best Apache. I have come up with a few owner reviews of the RTR Fi mainly on the net stating that there is somewhat loss of acceleration somewhere around the 2000-3000 rpm mark..
Did you experience any such thing..?? In comparison with the FZ16.. I have personally liked the Apache RTR 160 (Non Fi) and the Pulsar 180 more fun to ride.. I too loved the RTR(non efi)...the feedback is just awesome and it loves to be revved hard...looking forward to the 180cc "Apache menace"...But I still don't understand why TVS boffins have 17 inch tyre up front and the 18 inch one at the rear...dunno how it helps the bike.. I didn't noticed any loss of acceleration in the rpm band say in the 3rd or the 4th gear, but ya in the 1st and the 2nd gear there was a sheer lack of pickup across all rpm range.... I felt the bike just refused to zip off.